In my final tile for the second week I wanted to experiment a little with the Coil tangle & to try some of the other tangles that Marie taught us. She also introduced us to a grid based tangle of her own called 'Happy Dance' which I was particularly keen to try as I'm rather partial to the grid format. 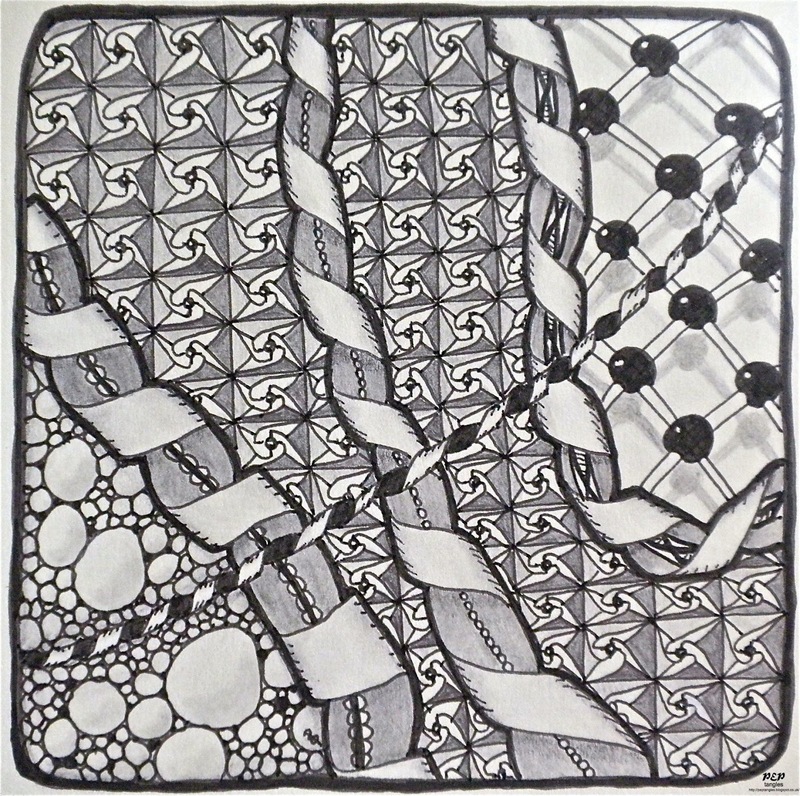 In my previous post I used TanglePatterns String 002 & I wanted to use that again as part of my contribution to the Chocolate Baroque Zentangle Group's current challenge theme based upon the word "Favourite." I have a particular liking for taking something - in this case it's the string & the Coil tangle - & exploring different aspects of it. 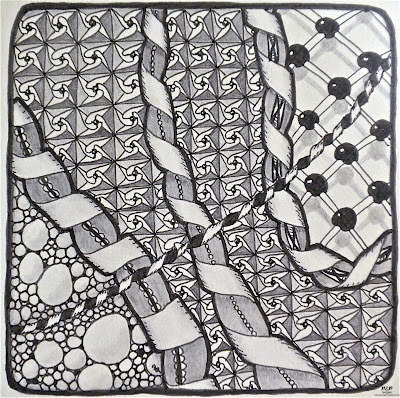 The type of shading technique I used for the Chemystery tangle (top right) is rapidly becoming a favourite of mine & my liking for grids also make this tile a good illustration of the "Favourite" theme. Fantastic dimension with those coils, Paula! This is beautiful! Amazing again Paula, I can't begin to imagine how long this takes you, but such sensational results. Another masterpiece to add to the fabulous wallet you created in your last post! these coils are very nice, paula! i haven't tried that one yet, i might have to - they look hard, though. you make them look easy! and i love the shading in your far right segment - under the lines and beads - really fabulous! so much dimension!! amazing shading! !...you should give yourself a big pat on the back:)...it is really a work of art. aha! finally I found you .. .. my pc's cogs turn so slowly it's taken an afternoon to follow the links .. .. but well worth it to see your fabulous tangle doodles! hope you are keeping well. Your shading is great Paula, I especially like that under Chemysetry, must have a go at Happy Dance as well. Not tangled for ages.